I have posted in the past about journals from the Hello Angel line from Fox Chapel Publishing.Today I'd like to discuss a book that has been put together as king of a crafting book from the artwork from those journals. Brighten up someone's day with dazzling Hello Angel flower art. 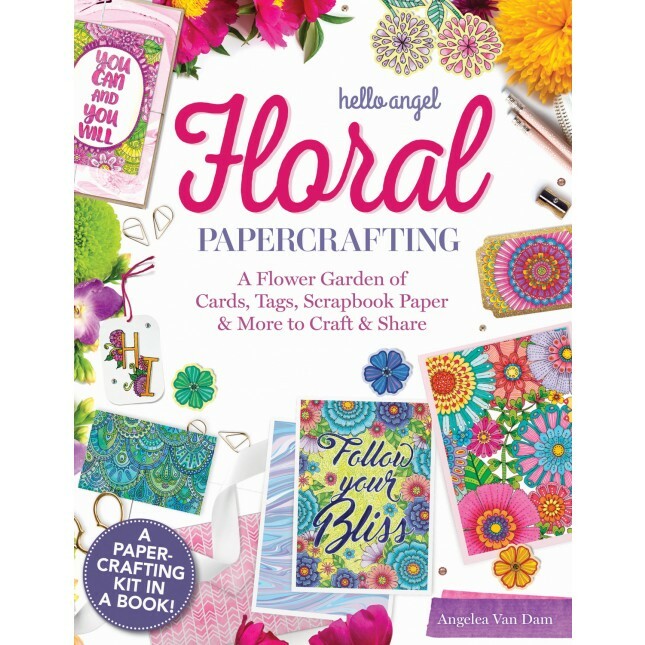 Hello Angel Floral Papercrafting contains everything you need to create and share more than 100 unique cards, envelopes, gift tags, bookmarks, art prints, mini-posters, and more. Featuring brightly colored floral designs from popular artist Hello Angel (Angelea Van Dam) this complete papercrafting kit in a book includes plenty of scrapbook paper to use with included templates. This book is a terrific value. With this crafting book you can actually do a number of different projects and create cards, envelopes, gift tags, bookmarks, scrapbook paper & more to craft and share with anyone. It includes a generous supply of double-sided scrapbook paper that is perfect for all the craft ideas included in the book. Buying this many pieces of scrapbook paper, cards, tags etc. separately would cost more than twice the price of this book. I didn't have any colored pencils or markers, otherwise I would have colored in some of the tags on my own. I took out one to make a marker for my books. I plan on using some of these to make tags for birthday tags on gifts and possibly make my own scrapbook of the past couple trips we made to Greece. The paper in here is perfect for that. I have never made a scrapbook before but I have a lot of materials now and I'd like to make one that is of my own choosing, just the way I'd like it to be. This book has a lot of colors that I like. It's all very reminiscent of the 1960's and 1970's, when colors were beautiful and bright together. It is also reminiscent of Vera Bradley patterns too. I love this book and think it would make a great gift. The holidays are not that far away and this would be perfect for a gift for a mom, wife, sister, daughter or aunt. I am going to put this item in my Holiday Gift Guide 2018. So expect to see it there too! This book makes a great gift to yourself for any crafting you want to do OR it makes a great gift for any craft maven. This book is available online atwww.foxchapelpublishing.com and www.amazon.com.